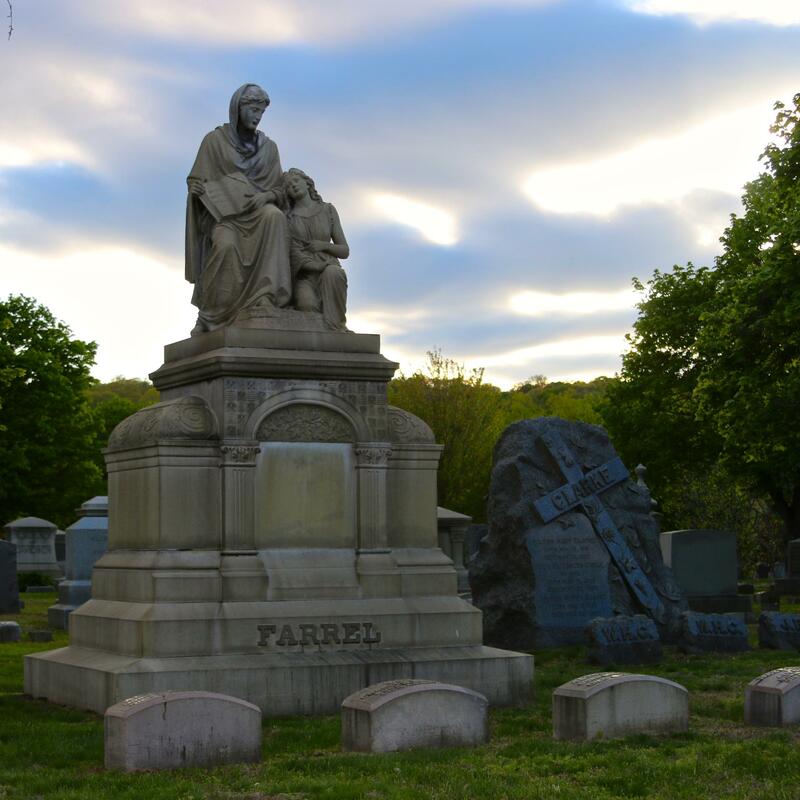 In 1857 a group of concerned citizens met at the office of the Farrel Foundry & Machine Co. for the purpose of organizing a Burying Ground Association in Ansonia for the citizens of the area. Articles of Association were adopted in February of 1858. At that time the Association began buying land on the high land west of the Naugatuck River to start the cemetery. It was originally a grove of small pine trees, which gave the name to the Association. On April 21, 1876 the large circular plot in front of the then main entrance was set apart to the memory of the soldiers and sailors of the town who gave their lives to their country in the war of the Rebellion. In the center stands the soldiers’ monument which was dedicated May 30, 1876. The Association also set apart a small plot called the Soldiers’ Rest for the burial of any poor and unfortunate soldier or sailor who died in our midst without family or friends. The first funeral cortege that entered the cemetery was for a six year old girl who died January 2, 1858. 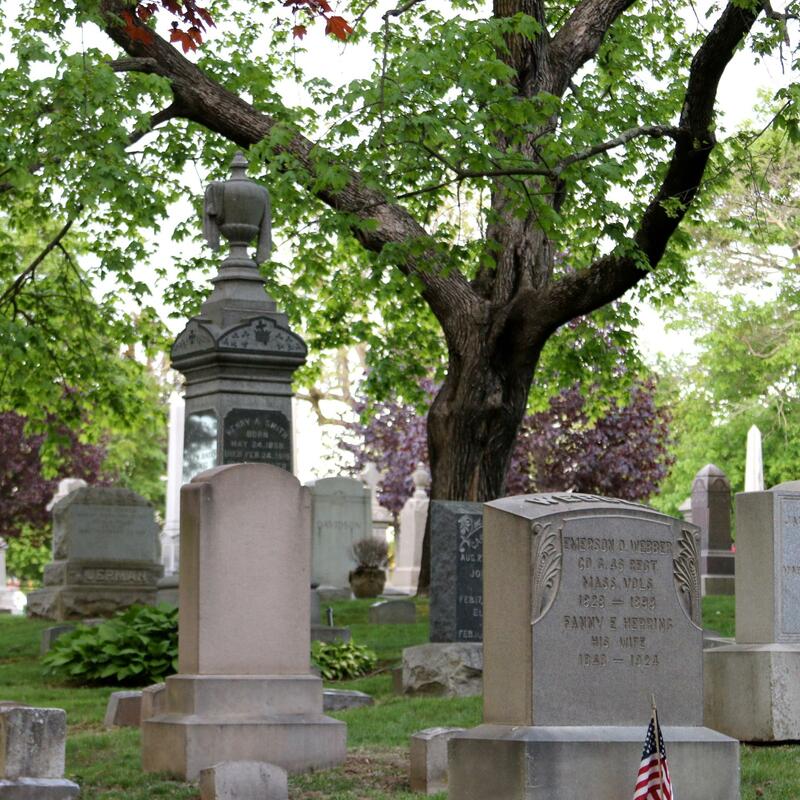 The cemetery property is owned exclusively by the Cemetery Association, and every person who buys a lot in the cemetery becomes a legal member of the Association. In May of 1927 the main entrance to the cemetery was changed from Grove Street to Church Street. The founding fathers of Ansonia are some of the prominent people buried in this cemetery. Among them are The Farrel family, Almon, Franklin, Franklin Jr. and Franklin III, who started Farrel Foundry which manufactured large machinery; Charles H. Pine who donated a mansion to form Pine School, and who donated our beautiful chapel; James M. Emerson, founder of the Evening Sentinel newspaper, Col. William Wooster, a commander in the Civil War; J.H. Bartholomew who helped establish Ansonia Brass & Copper Co.; Erwin M. Webster, 2nd mayor of Ansonia; William Alfred Nelson, President of Savings Bank of Ansonia; William Bristol who formed a coal business and was an original incorporator and 1st President of Ansonia Savings Bank; William Terry who served as an assistant surgeon at the US Military Hospital of Alexandria, VA during the Civil War; and William Wallace who experimented with carbon arc lighting and flooded Ansonia with light meriting a visit by Thomas Edison who acknowledged him as a great help toward the development of the incandescent light bulb. Pine Grove is open for visiting 365 days per year. Visitation hours are from sunrise to sunset. Monday – Friday 9 A.M. to 12 Noon. Saturdays may be available by appointment only.